Roadside attractions attract, so we pulled off when we saw a giant white Apatosaurus and a Tyrannosaurus Rex. 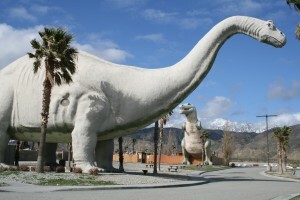 What exactly were these concrete dinosaurs doing in Cabazon? Was this an old dig site? Were fossilized dinosaur tracks preserved in mud somewhere? Walking up to the Apatosaurus we quickly discovered it is actually hollow—a reptilian Trojan horse housing a gift shop. We climbed the stairwell leg, and found ourselves in the belly of a well-lit space, stocked with rubber dinosaur models, toy plastic weaponry, posters, puzzles and trinkets. It didn’t take very long, however, glancing at the wall displays, to figure out what was really going on: this roadside stop is not the product of science, but of theology. The Cabazon dinosaur park, dubbed The World’s Biggest Dinosaurs Museum, is a “young earth” propaganda post, a science-seeming zone for pressing travelers with opinions about creationism and a 6,000 year-old earth. Imagine you wished to promulgate opinions about Evangelical Christianity from the side of the road. The first thought might be to build a giant roadside stone Jesus, like ‘Christ the Redeemer’ in Rio, or a giant cross, or enormous stone tablet effigies like the Ten Commandments. Features like these would undoubtedly attract the faithful, but then you are only preaching to the choir. Extinct gigantic reptiles, on the other hand, have far wider appeal. The marketing ploy seems to be, entice the kiddies and then sneak theology in through the back door. But there’s something much more fundamental going on here—an attempt to de-claw the tiger of fact. 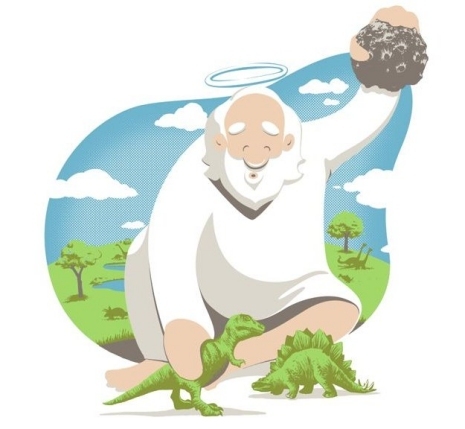 While the fossil record is unthreatening to many liberal Christians, it poses big problems for literalists who believe their faith limits the Earth to 6,000 years. So the strategy appears to be to engage—nay impersonate—the enemy, and concoct a larger-than-life straw man argument. After all, to proselytize is not merely to spread the Gospel, but to remove doubts. The Cabazon dinosaur park fits the tyrannosaurus rex of fact with rubber teeth. It is as if Bush and Cheney were to open a “Missing WMD” museum, where distorted displays use ‘absence of evidence’ as the very selling point proving WMDs must have existed. All of this took me back to the Nye-Ham debate in early February of this year. Bill Nye’s willingness to take-on Creationist and Biblical literalist Ken Ham seemed genuinely motivated by a sense of duty. Nye, a popular face for science, is concerned about the cultural decline of critical thinking, and its effects on education, the economy, even national security. To allow Trojan horse science into your camp—whether your school, your church, or just your own head—is to risk losing the power to distinguish the real from false, solid truth from the hollow simulacrum. As science is merely a word for refined methods of critical thinking, it is a sad irony that a decline in science literacy spawns misrepresentations of science itself, standing tall like dinosaur imposters. A 2012 Gallup Poll tallied creationists at 46% of the population, and it is unlikely that debates like this will affect that number. Pseudo-science is not going away any time soon, nor is Ham’s high-tech Creation Museum in Kentucky about to close. But while most of the concern from Nye’s camp is for guarding the purity of science by disrobing and banishing the imposter, I started to wonder about the other side of the coin. 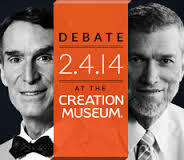 It is not just science that is misrepresented and harmed by the Creation Museum; it is also the Bible. Far from being vindicated by pseudo-empirical rationalization, doesn’t scripture lose its identity by being nailed to the cross of fact? Doesn’t literalism harm the suggestive, mythic, even spiritual power of ‘The Book’? You can hardly convince a man of an error in a lifetime, but must content yourself with the reflection that the progress of science is slow. If he is not convinced, his grandchildren may be. The geologists tell us that it took one hundred years to prove that fossils are organic, and one hundred and fifty more, to prove that they are not to be referred to the Noachian deluge. Would Thoreau have believed that one hundred sixty years after writing this a significant portion of American public would regress? The great grandchildren of his example’s grandchildren have reverted to the Noah’s deluge again, and thus retarded the progress of ideas by three hundred years. Thoreau obviously did not read the Bible as ‘a believer.’ But neither did he approach it with ‘Bible as literature’ academic detachment. Rather, he saw it as a portion of the universal wisdom literature revered in all traditions. “Mythology is only the most ancient history and biography,” Thoreau wrote in A Week. “So far from being false or fabulous in the common sense, [mythology] contains only enduring and essential truth, the I and you, the here and there, the now and then, being omitted.” Just the sort of algebra one might expect to hear from a natural scientist, the barest form of law, abstracted from particulars. Like other generalists of his day, Thoreau had a foot in both worlds, science and the humanities, and he saw necessary truth in both. Long before Joseph Campbell, he believed a rich, if subtle, wisdom pervaded the world’s proverbs, tales and myths. “The fable which is naturally and truly composed, so as to satisfy the imagination, ere it addresses the understanding, beautiful though strange as a wild-flower, is to the wise man an apothegm, and admits of his most generous interpretation.” He likened myths to enduring skeletons, fleshed-out according to the interests of the epoch. More remarkable than their hidden meanings and ethical lights is “the readiness with which they may be made to express a variety of truths.” This relativity might seem the very antithesis of truth. We crave concrete fact and definite inference, and it seems that Biblical literalists have fallen under this same epistemic spell. There is a peculiar atavistic Positivism at work here. Having accepted unwittingly, even begrudgingly, the empirical equation that truth = fact, the Creationist wing is compelled to forge effigies of science, and bend them, like the neck of a rubber Apatosaurus, to its purposes. But truths having to do with the moral and psychological life are not recognized this way. They are not bound by time, space, weight and measure, but encoded in story. The main point of a fable is to illuminate the present moment. Whether or not it has roots in fact—whether Odysseus existed as flesh and blood—makes no difference. Likewise, a biographical incident from the past may be factually ‘true’, but fabulously (that is, as a ‘fable’) meaningless—which is to say that its truth-value is simply, “it happened.” Lincoln ate bacon for breakfast on the morning of March 4, 1859. So what? Of course, many religionists resent the suggestion that their stories be regarded essentially as fables. To the modern mind this appears to be an intellectual downgrade—fact holds the highest truth value, and story is an airy nothing of the imagination. But story is the custodian of meaning, not fact. What does a fact ‘mean’ after all in itself, except, ‘it happened’? Story, on the other hand, carries ideas about morality and identity and purpose, which gives light and cohesion to thinking today. Ideas are the software for a meaningful life. A good idea does not require factual paternity in order to be legitimate. A bad idea sired in fact gains no lifting power thereby. If I’m told that Jesus actually lived and died for my sins, and requires my assent to this fact or I might be punished forever—it can’t matter to me. Even were you to find fossilized footprints in Jerusalem and genuine parchments in his handwriting in some buried temple, it is still a silly and vacuous idea. On the other hand, if I read in the Gospels about a Jewish reformer who preached essential equality irrespective of race, caste and creed, the curbing of the punitive will, and a spirituality of inwardness and sincerity, who lost his life because his message and popularity threatened both religious and secular authorities—why should it matter to me whether Jesus actually lived or not? The story is compelling and meaningful. There are many things I hold ahead of the ‘glare’ of science: a child’s smile; the sound of the surf; the taste of a tangerine; laughter; the grace of Fred and Ginger; a violin cadence. I am not saying that science cannot tell us much about the muscles in a child’s face, or the physics of waves, or the neural chemistry of hormones and taste buds. But I think you would be mistaken to confuse the mechanism for the meaning. Thoreau’s intellect spanned a broad spectrum of subjects spiritual to scientific, and he did not need to distort his science to protect his spirituality. Nevertheless, the ‘glare of science’ is a psychologically revealing expression, which suggests to me the idea that overly-aggressive analysis may overwhelm some subtle mental states, even some intuitive truths. A well-integrated thinker knows when to dim the lights, like a lover protecting a mood, or an astronomer who turns from a faint star so as to see it better. But the phrase also suggests the bullying forcefulness of scientific reductionism, as when, for instance, the motive power for all of life (and therefore your motivation, too) is pinned to the blind impulse of the selfish gene; or a facile identification of the mind with the brain is posited due to methodological restrictions of empirical science. If Bible Belters shrink from the sterile reductionism of some interpreters of science, holding forth for the dignity of their minds and the sanctity of their religious culture, why then do they leap into literalism, an equally fatal form of reductionism? Absent the poet’s auroral light, the wise man’s intuition, the story-teller’s analogy, what can ‘truth’ mean except a banal correspondence to fact? The most ridiculous fate for the Bible is the glaring museum light of positivism. Imagine visiting a Santa Barbara gallery for a show of local landscape paintings by The Oak Group. Why do we view exhibits like this? What do we experience? What do the paintings mean? Certainly there are people who would breeze through the display, naming familiar locales, “This one is Hendry’s Beach; that’s the Sedgwick Reserve; and here’s one of the San Marcos Foothills.” But we all know that the point of the painting is not the imitation of fact, nor is naming the fact the same as experiencing the painting. Send the exhibit to the East Coast, and many people who know nothing about Santa Barbara geography can still experience the sublimity of the paintings. Even were the viewer to suppose that the scenes are entirely imaginary, with no correspondence to actual geography, the spiritual enrichment is none the less real. When liberties have been taken in a novel with historic roots, the book is labeled historical fiction. Reading such a novel, we understand that real events have been recombined, manipulated and very possibly distorted. It didn’t happen this way, the author allows, but perhaps it should have. . . . There ought to be room for fantasy in our lives. Stories, even when they aspire to what we term ‘realism,’ are attempts to improve on reality, to sharpen and organize it, if nothing else. Goodness knows, we cannot escape ‘reality,’ but movies ought to be entitled to give us a break from it now and then without the fact-checkers piling on. And the Bible deserves the same break. Dissociating the Bible from fact does not make the book false or useless, any more than the Illiad, the Ramayana, the Mahabharata, or the Popol Vuh are false and useless. Thoreau recommended the reading of these bibles of mankind (or at least portions of them), not in his capacity as a natural scientist, but as someone who valued universal personal truths. “[H]ere are golden words, which the wisest men of antiquity have uttered, and whose worth the wise of every succeeding age have assured us of.” Like a butterfly, that worth has everything to lose by becoming a pinned museum specimen.